A mere few days ago — 27 June 2015 to be precise — charlieharvey.org.uk celebrated its 11th birthday. They grow up quick, don’t they? It is now officially old enough to go to big school, at least if the Tories haven’t closed all the schools yet. In internet terms, 11 is ancient. Not as ancient as charlieharvey.com, which I have had since 2001, making it old enough to be getting interested in drugs and boys or whatever 14 year olds are into these days. I digress. I thought I’d have a look at what the web was like when I launched this site iall those years ago in 2004, with massive thanks to the wonderful wayback machine. On 27 July 2004, Barack Obama was launching his career with a keynote speech at the Democratic National Convention, Iraq was in flames and I was registering a domain name. This was to be my "life admin" site with all the things I did online — a todo list, an RSS aggregator, a gallery of pictures, a calendar, my contact form and my webmail. A mixture of Facebook and Remember the Milk. I was able to "use perl and php and do interactive stuff". Easyspace, where I was hosting charlieharvey.com, didn’t have such advanced technologies, it would only host static HTML. The tech stack of the time was perl and CGI on Zeus web server. It was the first time I had paid for domain hosting for my own project, I think. The front page was an HTML meta redirect to a perl script called ctrl.pl, because it was supposed to be a "control panel". Nowadays, I guess we’d call it a dashboard and fill it with spurious graphs. I remember that one of my design objectives was to have a low page weight. I scrupulously avoided images and tried to do everything I could in CSS. The only images were the "Made with jEdit" and "Valid XHTML 1.0" buttons. Web standards were important to me even back in 2004, where it wasn’t clear that they would win out in the end. There was also a text-only version which had an even simpler layout. At the time, it was considered best practice to provide a text only version for people using screen readers. Screen readers must have come on a long way since then. Perhaps one of my favourite pages was the boozeulator which "allows the alcoholic cognescenti to calculate the efficiency of drinking a given beverage, by returning a "pissedness per pound"(PPP) quotient". In fact the boozeulator still exists and the code is still pretty much the same, albeit cut and pasted into a fancy web framework. Well, that was charlieharvey.org.uk in 2004. How about the rest of the Web? 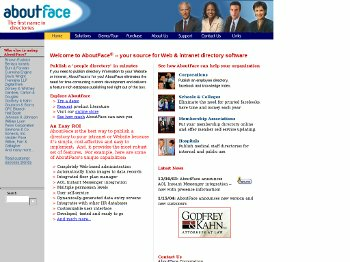 The now familiar www.facebook.com domain was being used by a company called AboutFace ® — your source for Web & intranet directory software . 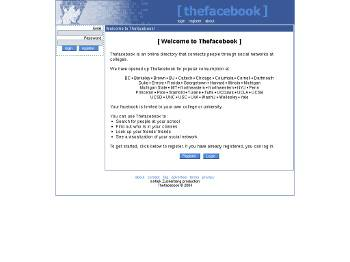 Facebook itself lived at thefacebook.com and described itself thus Thefacebook is an online directory that connects people through social networks at colleges . Interesting that it used the term social network to refer to real life relationships between people, rather than in the sense of a computer service as it is more commonly used today. Also worth noting is the image of Zuckerberg at the top left, mercifully since removed from the logo! 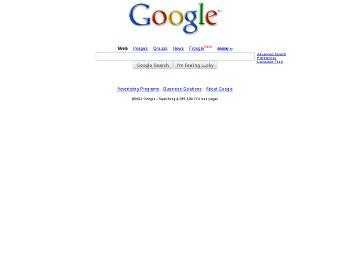 Good old google was not so different. There was a bit of drop shadow on their logo and Froogle (now Google Shopping) was new. Gmail had just launched on 1 April as a beta project with an impossibly huge storage capacity of 1GB. Gmail wouldn’t become generally available until 7 February 2007. 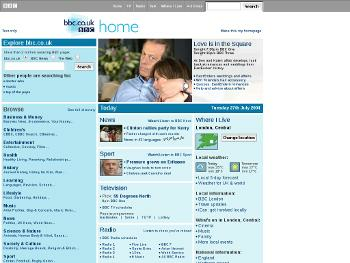 The BBC had a site that was optimized for 800px wide displays and which looked totally different from the way the site looks today. The BBC’s top story was about Dirty Den’s affair with Kate (this may prove nostalgic for those of you who watch Eastenders, personally I couldn’t give a toss). They had a text only version of their site at the time as well, just like me. I will concede that they had the idea before I did. 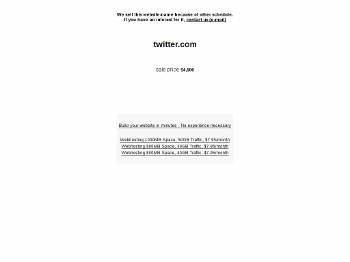 Twitter’s now-ubiquitous site twitter.com was for sale for $4,500 with an intriguing message "We sell this website-name because of other schedule. If you have an interest for it, contact us (e-mail)". At 102 characters that would fit in a Tweet! Time magazine did a special on the best websites of the year in 2004. Many of Time’s lineup are them around still, like meetup and eHow. The list includes Friendster, but not the soon to be popular Facebook and the once mighty MySpace. I just wanted to say it was delightful to take another person's trip down memory lane. It would take me a moment or two to really recall what the Internet was like back then but I was a very different person then. Just writing this I can think of one of the things I spent a great deal of time doing but it was so very different back then wasn't it? The other reason (the first in fact) I wanted to comment here is I love your term PPP; it's brilliant and I laughed out loud. Thanks.